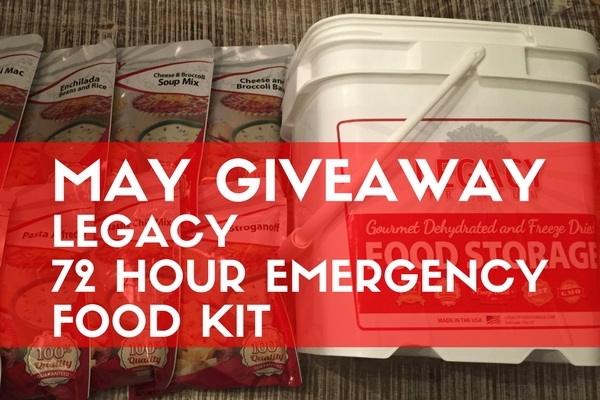 For May we are giving away a Legacy 72 Hour Emergency Food Kit! The Legacy 72 Hour Emergency Food Kit is a great way to get prepared for any emergency. Food storage is one of the cornerstones of any survival kit, and this Legacy bucket would make a great addition. You need an email account to take a shot at winning, and a Facebook, Google +, Twitter, and Pinterest account will all help your odds. Visit our pages and give us a like, follow, or shout. Visit our friends at Legacy Food Storage, they were generous enough to provide this month’s giveaway. Good luck! This giveaway has ended. Winner: Marc W.